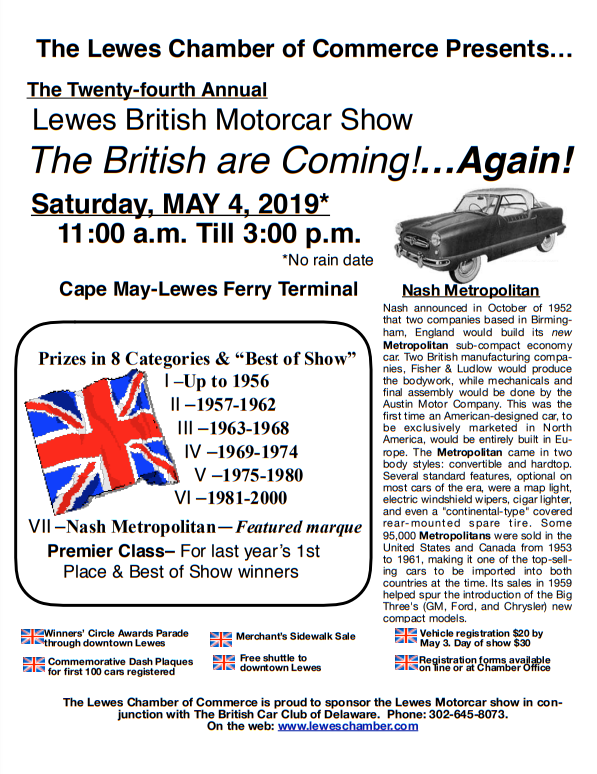 The Lewes British Motorcar Show “The British are coming...Again!” will welcome a wide array of classic British vehicles to Lewes on Saturday, May 4 (NO RAIN DATE). The Lewes Chamber of Commerce sponsors the show with assistance from the British Car Club of Delaware. It will be held from 11 a.m. to 3:00 p.m. at the Cape May-Lewes Ferry terminal. The show is supported by Southern Delaware Tourism. Twenty four years ago, Car Show chairman Mike Tyler and the British Car Club of Delaware originated the concept of staging a British Motorcar Show in the spring to attract visitors to Lewes before the summer season got into full swing. Each year the show features a different marque. The 2019 Featured Marque is the Nash Metropolitan. It’s an American-designed car, built in Europe and exclusively marketed in North America. Some 95,000 Metropolitans were sold in the United States and Canada from 1953 – 1961. Its sales in 1959 helped spur the introduction of the Big Three’s (GM, Ford and Chrysler) new compact models. According to Betsy Reamer, executive director of the Lewes Chamber of Commerce, “The popularity of this show has continued to grow over the years and the show’s venue at the Cape May-Lewes Ferry terminal allows for staging 100 + vehicles with the backdrop of the beautiful Delaware Bay.” One of the many attractions to attending this show, both as a car entrant and as a spectator, is the show’s proximity to the historic business district with its shopping (Sidewalk Sale bargains!) and restaurants. To that end, there are free shuttles during show hours (11 a.m. - 3 p.m.) to downtown Lewes for all the British car owners entered in the show and to the show attendees who pay the show’s $3 entry fee. The British Motorcar Show concludes at 3 p.m. with the Winners’ Circle Parade from the ferry terminal, across the drawbridge and then down Second Street. Show admission is $3 for adults and children under 12 are free. For more information and to register a car in advance, call the Lewes Chamber of Commerce at 302-645-8073. The fee to register the car in advance is $20 and $30 on May 4th. Car entrants can download the entry form by visiting the Chamber’s website at www.leweschamber.com, click on Calendar of Events and scroll down to British Motorcar Show entry form.